"A balanced dropship is a happy dropship." The Dropship is a craft purchasable by the Bunny in control of Robosaru for 1500¢. The Dropship arrives every 80 seconds, and drops its contents at the map's drop zone. The Dropship casts a large shadow on the ground indicating where it is blocking Robosaru's view. The Dropship however does not obstruct Robosaru's line of fire: bullets will pass right through the Dropship. If the dropShipOnStart server setting is enabled, a Dropship will spawn the first time a player subverts while the minimum player quota is satisfied. In either case, a Dropship cannot be purchased if there are less than the minimum players in a server. No items can be purchased until a Dropship exists. Robosaru can purchase items at any time, which are then placed in a random location inside the Dropship. Items purchased by Robosaru will never spawn close to any of the Dropship's walls. This is to prevent accidental Dropship imbalance. 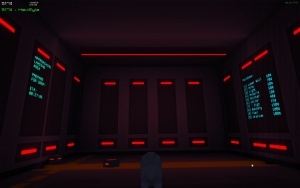 Bunnies can only purchase items while they are inside the Dropship, which will be equipped to the Bunny if they have any spare slots, or dropped to the ground in front of them if they don't. The Pointer cannot be used in the Dropship, and placeable items cannot be erected. Inside the Dropship, the Sensor functions as normal as it were in Cyan Mode. Any items purchased by the Bunnies will have their cost deducted from that Bunny's bank, instead of Robosaru's. While a Dropship exists, Bunnies no longer spawn in a random location on the map, and instead spawn inside the Dropship. 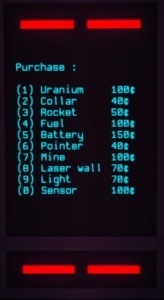 While inside the Dropship, Bunnies only receive 1¢ every two seconds (as opposed to the regular 2¢) and do not gain the ¢ bonus from collars. Inside the Dropship is a dotted line. If items and Bunnies are behind the line, they will imbalance the Dropship. The Dropship can only be imbalanced while the ETA is longer than 30 seconds. 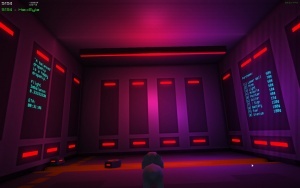 Once the ETA reaches 30 seconds, the Dropship will appear in the map and its internal light will dim, in addition to playing a short beep for its occupants. The Flight Imbalance percentage at that point in time is used to determine the chance the Dropship will crash. Different objects have different weights. The heavier an object, the more it contributes to the Flight Imbalance. 100% Flight Imbalance is achieved by placing 300 units in the imbalance zone. This number increases linearly per player on the server, so on a server with 5 players, 100% imbalance requires 1500 Units of weight. The Flight Imbalance can exceed 100%, and at 120%, the Dropship will crash immediately provided the ETA is greater than 30 seconds. If the Dropship is crashing, it will not beep at 30 seconds, and instead its contents will experience zero Gs before the Dropship explodes at a random location on the map. When the Dropship crashes, its contents are scattered around the crash site along with flames and smoke clouds. 50% of the uncarried items inside the Dropship are destroyed. A new Dropship will not arrive until it is repurchased. Bunnies in the dropship always survive the crash. Often, however, they are killed by a secondary factor such as landing directly on the robot or walking into a flame produced by the crash that was very close to them. A crashing Dropship makes a very distinctive high-pitched sound for all players who are already on the map. If the Dropship lands close enough, or on top of a Bunny, that bunny will be killed. This page was last modified on 21 July 2015, at 07:42.